For other uses, see Primary (disambiguation). Closed primary. (synonyms: internal primaries, party primaries) In the case of closed primaries, internal primaries, or party primaries, only party members can vote. Open primary. All voters can take part in an open primary and may cast votes on a ballot of any party. The party may require them to express their support to the party's values and pay a small contribution to the costs of the primary. Closed primary. People may vote in a party's primary only if they are registered members of that party prior to election day. Independents cannot participate. Note that because some political parties name themselves independent, the terms "non-partisan" or "unaffiliated" often replace "independent" when referring to those who are not affiliated with a political party. Eleven states – Delaware, Florida, Kansas, Kentucky, Maine, Maryland, District of Columbia, Nebraska, New Mexico, New York, Pennsylvania, and Wyoming – have closed primaries. Semi-closed. As in closed primaries, registered party members can vote only in their own party's primary. Semi-closed systems, however, allow unaffiliated voters to participate as well. Depending on the state, independents either make their choice of party primary privately, inside the voting booth, or publicly, by registering with any party on Election Day. Fourteen states – Alaska, Arizona, Colorado, Iowa, Kansas, Massachusetts, New Hampshire, New Jersey, North Carolina, Ohio, Oregon, Rhode Island, Utah, and West Virginia – have semi-closed primaries that allow voters to register or change party preference on election day. Open primary. A registered voter may vote in any party primary regardless of his or her own party affiliation. Eleven states - Alabama, Arkansas, Georgia, Hawaii, Michigan, Minnesota, Missouri, Montana, North Dakota, Vermont, and Wisconsin - have open primaries. When voters do not register with a party before the primary, it is called a pick-a-party primary because the voter can select which party's primary he or she wishes to vote in on election day. Because of the open nature of this system, a practice known as raiding may occur. Raiding consists of voters of one party crossing over and voting in the primary of another party, effectively allowing a party to help choose its opposition's candidate. The theory is that opposing party members vote for the weakest candidate of the opposite party in order to give their own party the advantage in the general election. An example of this can be seen in the 1998 Vermont senatorial primary with the nomination of Fred Tuttle as the Republican candidate in the general election. Semi-open. A registered voter need not publicly declare which political party's primary that they will vote in before entering the voting booth. When voters identify themselves to the election officials, they must request a party's specific ballot. Only one ballot is cast by each voter. In many states with semi-open primaries, election officials or poll workers from their respective parties record each voter's choice of party and provide access to this information. The primary difference between a semi-open and open primary system is the use of a party-specific ballot. In a semi-open primary, a public declaration in front of the election judges is made and a party-specific ballot given to the voter to cast. Certain states that use the open-primary format may print a single ballot and the voter must choose on the ballot itself which political party's candidates they will select for a contested office. Blanket primary. A primary in which the ballot is not restricted to candidates from one party. Nonpartisan blanket primary. A primary in which the ballot is not restricted to candidates from one party, where the top two candidates advance to the general election regardless of party affiliation. Louisiana has famously operated under this system, which has been nicknamed the "jungle primary." California has used a nonpartisan blanket primary since 2012 after passing Proposition 14 in 2010, and the State of Washington has used a nonpartisan blanket primary since 2008. The United States is one of the few countries to select candidates through popular vote in a primary election system; most countries rely on party leaders to vote candidates, as was previously the case in the U.S. In modern politics, primary elections have been described as a significant vehicle for taking decision-making from political insiders to the voters, though this is disputed by select political science research. The selection of candidates for federal, state, and local general elections takes place in primary elections organized by the public administration for the general voting public to participate in for the purpose of nominating the respective parties' official candidates; state voters start the electoral process for governors and legislators through the primary process, as well as for many local officials from city councilors to county commissioners. The candidate who moves from the primary to be successful in the general election takes public office. Primaries can be used in nonpartisan elections to reduce the set of candidates that go on to the general election (qualifying primary). (In the U.S., many city, county and school board elections are non-partisan.) Generally, if a candidate receives more than 50% of the vote in the primary, he or she is automatically elected, without having to run again in the general election. If no candidate receives a majority, twice as many candidates pass the primary as can win in the general election, so a single seat election primary would allow the top two primary candidates to participate in the general election following. When a qualifying primary is applied to a partisan election, it becomes what is generally known as a blanket or Louisiana primary: typically, if no candidate wins a majority in the primary, the two candidates receiving the highest pluralities, regardless of party affiliation, go on to a general election that is in effect a run-off. This often has the effect of eliminating minor parties from the general election, and frequently the general election becomes a single-party election. Unlike a plurality voting system, a run-off system meets the Condorcet loser criterion in that the candidate that ultimately wins would not have been beaten in a two-way race with every one of the other candidates. Because many Washington residents were disappointed over the loss of their blanket primary, which the Washington State Grange helped institute in 1935, the Grange filed Initiative 872 in 2004 to establish a blanket primary for partisan races, thereby allowing voters to once again cross party lines in the primary election. The two candidates with the most votes then advance to the general election, regardless of their party affiliation. Supporters claimed it would bring back voter choice; opponents said it would exclude third parties and independents from general election ballots, could result in Democratic or Republican-only races in certain districts, and would in fact reduce voter choice. The initiative was put to a public vote in November 2004 and passed. On July 15, 2005, the initiative was found unconstitutional by the U.S. District Court for the Western District of Washington. The U.S. Supreme Court heard the Grange's appeal of the case in October 2007. In March 2008, the Supreme Court upheld the constitutionality of the Grange-sponsored Top 2 primary, citing a lack of compelling evidence to overturn the voter-approved initiative. In elections using electoral systems where strategic nomination is a concern, primaries can be very important in preventing "clone" candidates that split their constituency's vote because of their similarities. Primaries allow political parties to select and unite behind one candidate. However, tactical voting is sometimes a concern in non-partisan primaries as members of the opposite party can vote for the weaker candidate in order to face an easier general election. In California, under Proposition 14 (Top Two Candidates Open Primary Act), a voter-approved referendum, in all races except for that for U.S. president and county central committee offices, all candidates running in a primary election regardless of party will appear on a single primary election ballot and voters may vote for any candidate, with the top two vote-getters overall moving on to the general election regardless of party. The effect of this is that it will be possible for two Republicans or two Democrats to compete against each other in a general election if those candidates receive the most primary-election support. As a result of a federal court decision in Idaho, the 2011 Idaho Legislature passed House Bill 351 implementing a closed primary system. Oregon was the first American state in which a binding primary election was conducted entirely via the internet. The election was held by the Independent Party of Oregon in July, 2010. In the United States, Iowa and New Hampshire have drawn attention every four years because they hold the first caucus and primary election, respectively, and often give a candidate the momentum to win their party's nomination. A criticism of the current presidential primary election schedule is that it gives undue weight to the few states with early primaries, as those states often build momentum for leading candidates and rule out trailing candidates long before the rest of the country has even had a chance to weigh in, leaving the last states with virtually no actual input on the process. The counterargument to this criticism, however, is that, by subjecting candidates to the scrutiny of a few early states, the parties can weed out candidates who are unfit for office. The Democratic National Committee (DNC) proposed a new schedule and a new rule set for the 2008 Presidential primary elections. Among the changes: the primary election cycle would start nearly a year earlier than in previous cycles, states from the West and the South would be included in the earlier part of the schedule, and candidates who run in primary elections not held in accordance with the DNC's proposed schedule (as the DNC does not have any direct control over each state's official election schedules) would be penalized by being stripped of delegates won in offending states. The New York Times called the move, "the biggest shift in the way Democrats have nominated their presidential candidates in 30 years." Of note regarding the DNC's proposed 2008 Presidential primary election schedule is that it contrasted with the Republican National Committee's (RNC) rules regarding presidential primary elections. "No presidential primary, caucus, convention, or other meeting may be held for the purpose of voting for a presidential candidate and/or selecting delegates or alternate delegates to the national convention, prior to the first Tuesday of February in the year in which the national convention is held." In 2020, this date is February 4. Candidates for U.S. President who seek their party's nomination participate in primary elections run by state governments, or caucuses run by the political parties. Unlike an election where the only participation is casting a ballot, a caucus is a gathering or "meeting of party members designed to select candidates and propose policies". Both primaries and caucuses are used in the presidential nomination process, beginning in January or February and culminating in the late summer political party conventions. Candidates may earn convention delegates from each state primary or caucus. Sitting presidents generally do not face serious competition from their party. While it is clear that the closed/semi-closed/semi-open/open classification commonly used by scholars studying primary systems does not fully explain the highly nuanced differences seen from state to state, still, it is very useful and has real-world implications for the electorate, election officials, and the candidates themselves. As far as the electorate is concerned, the extent of participation allowed to weak partisans and independents depends almost solely on which of the aforementioned categories best describes their state's primary system. Clearly, open and semi-open systems favor this type of voter, since they can choose which primary they vote in on a yearly basis under these models. In closed primary systems, true independents are, for all practical purposes, shut out of the process. This classification further affects the relationship between primary elections and election commissioners and officials. The more open the system, the greater the chance of raiding, or voters voting in the other party's primary in hopes of getting a weaker opponent chosen to run against a strong candidate in the general election. Raiding has proven stressful to the relationships between political parties, who feel cheated by the system, and election officials, who try to make the system run as smoothly as possible. Perhaps the most dramatic effect this classification system has on the primary process is its influence on the candidates themselves. Whether a system is open or closed dictates the way candidates run their campaigns. In a closed system, from the time a candidate qualifies to the day of the primary, he tends to have to cater to partisans, who tend to lean to the more extreme ends of the ideological spectrum. In the general election, under the assumptions of the Median Voter Theorem, the candidate must move more towards the center in hopes of capturing a plurality. In Europe, primaries are not organized by the public administration but by parties themselves. Legislation is mostly silent on primaries. The main reason to this is that the electoral system used to form governments, be it proportional representation or two-round systems, lessens the need for an open primary. Governments are not involved in the process; however, parties may need their cooperation, notably in the case of an open primary, e.g. to obtain the electoral roll, or to cover the territory with a sufficient number of polling stations. Whereas closed primaries are rather common within many European countries, few political parties in Europe already opted for open primaries. Parties generally organise primaries to nominate the party leader (leadership election). The underlying reason for that is that most European countries are parliamentary democracies. National governments are derived from the majority in the Parliament, which means that the head of the government is generally the leader of the winning party. France is one exception to this rule. Closed primaries happen in many European countries, while open primaries have so far only occurred in the socialist and social-democratic parties in Greece and Italy, whereas the France's Socialist Party organised the first open primary in France in October 2011. One of the more recent developments is organizing primaries on the European level. European parties that organized primaries so far were the European Green Party (EGP) and the Party of European Socialists (PES). Primary election were introduced in Italy to establish the centre-left candidates for 2005 regional election. In that occasion the centre-left The Union coalition held open primaries in order to select candidates for President of Apulia and Calabria. A more politically significant primary was held on 16 October 2005, when The Union asked its voters to decide the candidate for Prime Minister in the 2006 general election: 4,300,000 voters showed up and Romano Prodi won hands down. Two years later, on 14 October 2007, voters of the Democratic Party were called to choose the party leader among a list of six, their representatives to the Constituent Assembly and the local leaders. The primary was a success, involving more than 3,500,000 people across Italy, and gave to the winner Walter Veltroni momentum in a difficult period for the government and the centre-left coalition. The centre-right (see House of Freedoms, The People of Freedom, centre-right coalition and Forza Italia) has never held a primary at the national level, but held some experiments at the very local level. In France, elections follow a two-round system. In the first round, all candidates who have qualified (for example, by obtaining a minimal number of signatures of support from elected officials) are on the ballot. In practice, each candidate usually represents a political party, large or small. In the second round, held two weeks later, the top two candidates run against each other, with the candidates from losing parties usually endorsing one of the two finalists. The means by which the candidate of an established political party is selected has evolved. Until 2012, none of the six Presidents elected through direct election faced a competitive internal election. The right didn't hold often primary elections to decide for their national candidates. In 2007, Nicolas Sarkozy, President of the UMP, organized an approval "primary" without any opponent. He won by 98% and made his candidacy speech thereafter. In 2016, The Republicans held, on November 20 and 27, primaries to decide of their presidential candidate for 2017. On the left however, the Socialist Party, which helped François Mitterrand gain the Presidency for 14 years, has been plagued by internal divisions since the latter departed from politics. Rather than forming a new party, which is the habit on the right-wing, the party started to elect its nominee internally. A first try in 1995: Lionel Jospin won the nomination three months before the election. He lost in the run-off to Jacques Chirac. Later in 2002, although the candidacy of then-PM Jospin was undisputed in his party, each of the five left-wing parties of the government he led sent a candidate, paving the way for all five to lose by the Spoiler effect. The idea made progress as the 2007 race approached, once the referendum on a European constitution was over. The latter showed strong ideological divisions within the left-wing spectrum, and the Socialist Party itself. This prevented the possibility of a primary spanning the whole left-wing, that would give its support to a presidential candidate. Given that no majority supported either a leader or a split, a registration campaign, enabling membership for only 20 euros, and a closed primary was organized, which Ségolène Royal won. She qualified to the national run-off that she lost to Nicolas Sarkozy. In 2011, the Socialist Party decided to organise the first ever open primary in France to pick the Socialist party and the Radical Party of the Left nominee for the 2012 presidential election. Inspired by the 2008 U.S. primaries, it was seen as a way to reinvigorate the party. The idea was first proposed by Terra Nova, an independent left-leaning think tank, in a 2008 report. It was also criticized for going against the nature of the regime. The open primary was not state-organized : the party took charge of all the electoral procedures, planning to set up 10,000 voting polls. All citizens on the electoral rolls, members of the Socialist party and the Radical Party of the Left, and members of the parties' youth organisation (MJS and JRG), including minors of 15 to 18 years old, were entitled to vote in exchange for one euro to cover the costs. More than 3 million people participated in this first open primary, which was considered a success, and former party leader François Hollande was designated the Socialist and Radical candidate for the 2012 presidential election. Other parties organize membership primaries to choose their nominee, such as Europe Ecologie – Les Verts (EE-LV) (2006, 2011, 2016), and the French Communist Party in 2011. At the local level, membership primaries are the rule for Socialist Party's candidates, but these are usually not competitive. In order to tame potential feud in his party, and prepare the ground for a long campaign, Sarkozy pushed for a closed primary in 2006 to designate the UMP candidate for the 2008 election of the Mayor of Paris. Françoise de Panafieu was elected in a four-way race. However, she did not clinch the mayorship two years later. The first primaries in the history of Russia were held in May 2000 in St. Petersburg, the local branches of the parties Yabloko and the Union of Right Forces, who before the Gubernatorial election offered citizens to choose a single candidate from the democratic opposition. In 2007, before the parliamentary elections, United Russia held primaries in several regions. However, its results were not sufficiently taken into account when nominating candidates from the party. For example, the congress of United Russia included in the regional party list in the Samara region not the winners of the primaries, but those who did not even participate in the primaries. In the same year 2007, A Just Russia held the primaries to determine the candidate for the Gubernatorial election in Altai Krai. Anyone could vote for them, for which special items were opened. However, in the future, A Just Russia did not begin to pursue the primaries. In 2011, United Russia, together with the All-Russian People's Front, held primaries for the nomination of candidates for the parlmentary election. This vote was called the "All-People's Primaries", but in fact it was not. Candidates for the primaries were selected by special committees. Not even all party members had the right to vote, but only about 200,000 specially selected electors. In addition, the results of voting on the primaries were in most cases ignored. Of the 80 lists of regional groups of candidates for the State Duma, nominated by the congress of United Russia, only 8 lists coincided with the lists of winners of the primaries. All the same, the event played a role in the elimination of candidates: there were cases when the current deputies of the State Duma, having seen that they did not enjoy the support of electors, withdrew their candidacies. In the future, United Russia has sometimes resorted to an "open" model of primaries, which allows voting to all interested voters. In 2014, in the primaries of the "United Russia" before the elections to the Moscow City Duma, any Muscovite could vote, and not only registered electors. In 2016, the primaries for the selection of candidates for parliamentary elections were held by four parties: United Russia, People's Freedom Party, the Party of Growth and the Green Alliance. The most massive were the May 22, 2016 primaries of the United Russia, which could vote for every citizen who has an active electoral right. However, the primaries, as well as earlier, were not binding for the leadership of United Russia: a number of winners of the primaries were withdrawn by the leadership without any explanation of reasons, and in 18 single-seat constituencies the party did not nominate any candidates. A striking example was the Nizhny Tagil constituency, where the candidate from the United Russia was approved candidate, who took the 4th place in the primaries. Finally, a number of candidates were included in the party list on the proposal of the party leader Dmitry Medvedev from among those who did not even participate in the primaries. In 2017, the Party of Growth holds the primaries for the nomination of candidates for the presidential election. These are the first presidential primaries in the history of Russia. However, voting for candidates will take place via the Internet within three months, and, according to the spokesman of the party, the results of the primaries will not be mandatory for the nomination of the candidate and the party convention may nominate another candidate who does not even participate in the primaries, or even not nominate candidates and support President Vladimir Putin, if he decides to be re-elected. For the 2010 general election, the Conservative Party used open primaries to select two candidates for Member of Parliament. Further open primaries were used to select some Conservative candidates for the 2015 general election, and there are hopes other parties may nominate future candidates in this way. In autumn 2011, here was how the twenty-nine socialist, social-democratic, and labour parties member of the Party of European Socialists (PES) had designated their party leader. The case of UK's Labour party leadership election is specific, as three electoral colleges, each accounting for one third of the votes, participate in this primary election: Labour members of Parliament and of the European Parliament, party members and members of affiliated organisations such as trade unions. With a view to the European elections, many European political parties consider organising a presidential primary. Indeed, the Lisbon treaty, which entered into force in December 2009, lays down that the outcome of elections to the European Parliament must be taken into account in selecting the President of the Commission; the Commission is in some respects the executive branch of the EU and so its president can be regarded as the EU prime minister. Parties are therefore encouraged to designate their candidates for Commission president ahead of the next election in 2014, in order to allow voters to vote with a full knowledge of the facts. Many movements are now asking for primaries to designate these candidates. Already in April 2004, a former British conservative MEP, Tom Spencer, advocated for American-style primaries in the European People's Party: "A series of primary elections would be held at two-week intervals in February and March 2009. The primaries would start in the five smallest countries and continue every two weeks until the big five voted in late March. To avoid swamping by the parties from the big countries, one could divide the number of votes cast for each candidate in each country by that country's voting weight in the Council of Ministers. Candidates for the post of president would have to declare by 1 January 2009." 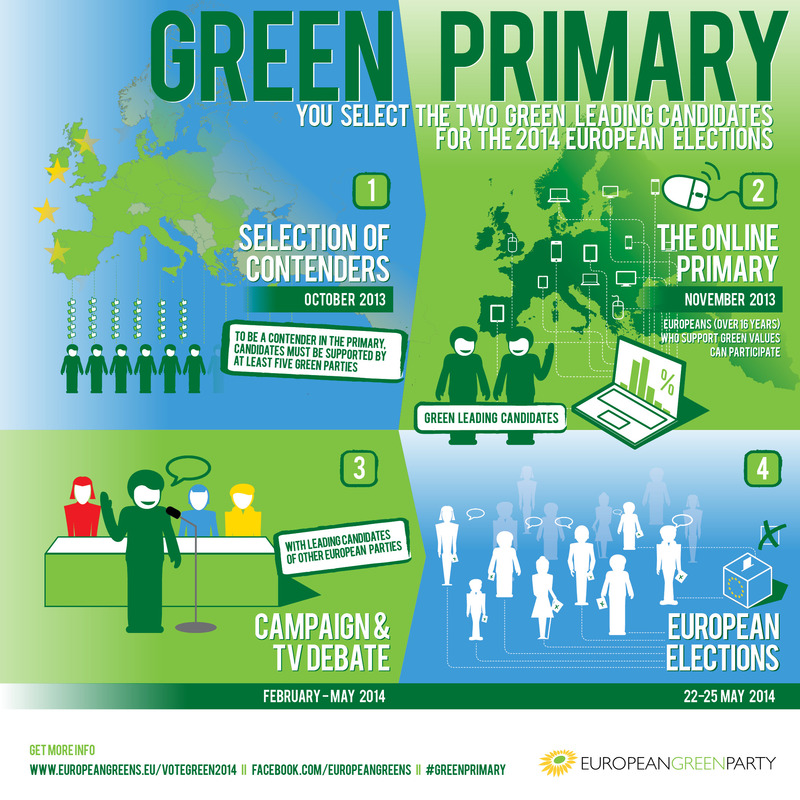 In July 2013 European Green Party (EGP) announced that it would run a first ever European-wide open primary as the preparation for the European elections in 2014. It was to be open to all citizens of the EU over the age of 16 who "supported green values" They elected two transnational candidates who were to be the face of the common campaign of the European green parties united in the EGP, and who also were their candidates for European Commission president. Following the defeat of the Party of European Socialists during the European elections of June 2009, the PES Congress that took place in Prague in December 2009 made the decision that PES would designate its own candidate before the 2014 European elections. A Campaign for a PES primary was then launched by PES supporters in June 2010, and it managed to convince the PES Council meeting in Warsaw in December 2010 to set up Working Group "Candidate 2014" in charge of proposing a procedure and timetable for a "democratic" and "transparent" designation process "bringing on board all our parties and all levels within the parties". The European think-tank Notre Europe also evokes the idea that European political parties should designate their candidate for Vice-president / High representative of the Union for foreign affairs. This would lead European parties to have "presidential tickets" on the American model. Finally, the European Parliament envisaged to introduce a requirement for internal democracy in the regulation on the statute of European political parties. European parties would therefore have to involve individual members in the major decisions such as designating the presidential candidate. Typically, in the months before an anticipated general election, local riding associations of political parties in each electoral district will schedule and announce a Nomination Meeting (similar to a nominating caucus in the United States). Would-be candidates will then file nomination papers with the association, and usually will devote time to solicit existing party members, and to sign up new party members who will also support them at the nomination meeting. At the meeting, typically each candidate will speak, and then members in attendance will vote. The electoral system most often used is an exhaustive ballot system; if no candidate has over 50% of the votes, the candidate with the lowest number of votes will be dropped and another ballot will be held. Also, other candidates who recognize that they will probably not win may withdraw between ballots, and may "throw their support" to (encourage their own supporters to vote for) another candidate. After the nomination meeting, the candidate and the association will obtain approval from party headquarters, and file the candidate's official nomination papers and necessary fees and deposits with Elections Canada or the provincial/territorial election commissions as appropriate. At times, party headquarters may overturn an association's chosen candidate; for example, if any scandalous information about the candidate comes to light after the nomination. A party headquarters may also "parachute" a prominent candidate into an easy-to-win riding, removing the need to have a nomination meeting. These situations only come up infrequently, as they tend to cause disillusionment among a party's supporters. Canadian political parties also organize their own elections of party leaders. Not only will the party leader run for a seat in their own chosen riding, they will also become Prime Minister (in a federal election) or Premier (in a province or territory) should their party win the most seats. If the party wins the second-most seats, the party leader will become Leader of the Official Opposition; if the party comes third or lower, the leader will still be recognized as the leader of their party, and will be responsible for co-ordinating the activities and affairs of their party's caucus in the legislature. In the past, Canadian political parties chose party leaders through the votes of delegates to a Leadership Convention. Local riding associations would choose delegates, usually in a manner similar to how they would choose a candidate for election. These delegates typically said explicitly which leadership candidate they would support. Those delegates, as well as other delegates (e.g. sitting party members of Parliament or the legislature, or delegates from party-affiliated organizations such as labor unions in the case of the New Democratic Party), would then vote, again using the exhaustive ballot method, until a leader was chosen. Lately, Canada's major political parties have moved to "one member, one vote" systems for their federal leadership elections. A leadership convention is still scheduled, but all party members have a chance to vote for the new leader. Typically, members may vote either in person as a delegate to the convention, online as they watch ballot-by-ballot results on the Internet or on television, or through a mail-in preferential ballot (handled by an "instant runoff" method). This method was used in the 2017 NDP leadership convention which chose Jagmeet Singh as federal party leader. When the Liberal Party chose Justin Trudeau as party leader in its leadership convention in 2013, they used a similar process, but only used online preferential voting for members not present at the convention and did not use mail-in ballots. As well, they scaled all members' votes such that each of the 308 riding associations' votes would be equal, notwithstanding how many or how few members voted in each riding. The Conservative Party of Canada also selected Andrew Scheer in a similar method. Democratic Party presidential primaries (recent: 2016; upcoming: 2020). Republican Party presidential primaries (recent: 2016; upcoming: 2020). Uruguay: recent: 2014, upcoming: 2019. United New Democratic Party (South Korea, 2007). Armenia. In an innovation on 2007 November 24 and 25, one political party conducted a non-binding Armenia-wide primary election. The party, the Armenian Revolutionary Federation, invited the public to vote to advise the party which of two candidates they should formally nominate for President of Armenia in the subsequent official election. What characterized it as a primary instead of a standard opinion poll was that the public knew of the primary in advance, all eligible voters were invited, and the voting was by secret ballot. "Some 68,183 people . . . voted in make-shift tents and mobile ballot boxes . . ."
Colombia In 2006, the Liberal Party and the socialist Democratic Pole hold primary elections, electing Horacio Serpa as liberal candidate and Carlos Gaviria as candidate of the Democratic Pole. For 2010 presidential electiones, four parties held primary elections: The Liberal Party elected former minister Rafael Pardo as candidate, the Democratic Pole elected senator Gustavo Petro, the Conservative Party chose ambassador Noemi Sanin and the Green Party chose former mayor of Bogota Antanas Mockus. Costa Rica, the three main political forces National Liberation Party, Social Christian Unity Party and Citizens' Action Party have all run primary elections several times. Republic of China (Taiwan): The Democratic Progressive Party selects all its candidates via opinion polls. The candidate with the highest poll rating will be nominated. The KMT selects candidates using a combination of opinion polls (worth 70%) and primary elections (worth 30%). Russia. The largest party in Russia, United Russia is holding primaries for the candidates to State Duma, a Russian lower-house chamber of the parliament. In Australia, the Australian Labor Party and the National Party have conducted limited experiments with primary-style pre-selections. ^ "Closed Primary Election Law & Legal Definition". USLegal.com. Retrieved 2012-11-07. ^ "Open Primary Law & Legal Definition". USLegal.com. Retrieved 2012-11-07. ^ a b "State Primary Election Types". NCSL. National Conference of State Legislatures. Retrieved 5 April 2016. ^ a b Bowman, Ann (2012). State and Local Government: The Essentials. Boston, MA: Wadsworth. p. 77. ^ "Register to Vote and Update Your Registration - Ohio Secretary of State". www.sos.state.oh.us. ^ Dye, Thomas R. (2009). Politics in States and Communities. New Jersey: Pearson Education. p. 152. ^ "History of Washington State Primary Systems" (PDF). ^ Ginsberg, Benjamin (2011). We the People: An Introduction to American Politics. New York: W.W. Norton & Co. p. 349. ^ Cohen, Marty. The Party Decides: Presidential Nominations before and after Reform. Chicago: University of Chicago, 2008. ^ Bowman, Ann (2006). State and Local Government: The Essentials. Boston, MA: Houghton Mifflin Co. pp. 75–77. ^ "Blanket Primary Law & Legal Definition". USLegal.com. Retrieved 2012-11-07. ^ "WASHINGTON STATE GRANGE v. WASHINGTON STATE REPUBLICAN PARTY". 18 March 2008. U.S. Supreme Court. Retrieved 22 April 2012. ^ "E-voting? Not ready yet". oregonlive.com. Retrieved 2010-08-11. ^ "Democrats Set Primary Calendar and Penalties". The New York Times. August 20, 2006. ^ "GOP.com". Gop.com. Archived from the original on 30 November 2008. Retrieved 2009-01-30. ^ Bardes, Barbara (2012). American Government and Politics Today: The Essentials 2011-12 Edition. Boston, MA: Wadsworth. p. 300. ^ "Предварительное голосование «Трибуна Роста» 2016". dvigrosta.ru. ^ ""Единая Россия" отменила итоги праймериз в Нижнем Тагиле". УралИнформБюро. ^ "Члены Партии роста предложили Путину уйти с поста президента". РБК. ^ "GP wins Tory 'open primary' race". BBC News. August 4, 2009. Retrieved May 22, 2010. ^ "Tories test the mood in Totnes". BBC News. August 4, 2009. Retrieved May 22, 2010. ^ "EGP announce innovative common campaign for European Elections". European Greens. ^ Cross, William (2006). "Chapter 7: Candidate Nomination in Canada's Political Parties". In Jon H. Pammett and Christopher Dornan. The Canadian Federal Election of 2006 (PDF). Toronto: Dundurn Press. pp. 171–195. ISBN 978-1-55002-650-4. ^ Horizon Armenian Weekly, English Supplement, 2007 December 3, page E1, "ARF conducts 'Primaries' ", a Yerkir agency report from the Armenian capital, Yerevan. ^ Holmes, Brenton (2011-07-18). "Pre-selecting candidates using US-style 'primaries'". Parliament of Australia. Retrieved 2017-03-29. ^ van Onselen, Peter (2009-01-17). "Nationals face up to primary challenge". The Australian. Retrieved 2017-03-29.